NSERC has announced the renewal of Dr. M.K. Peter Yau’s Hydro-Quebec Industrial Research Chair, at a value of over $2 million with contributions from NSERC, Hydro Quebec, McGill and Environment Canada. Under Phase II of the research program, Dr. Yau will continue his work in short-term forecasting of precipitation. If there’s anything that unites human beings around the globe, it’s our habit of complaining about the weather. If there’s something that unites Canadians in particular, it’s our habit of complaining about the inaccuracy of weather forecasting. But what if weather forecasting – especially when it comes to predicting rain and snow – could be made more accurate? That’s the issue Dr. M.K. Peter Yau, of the Department of Atmospheric and Oceanic Sciences in the Faculty of Science is hoping to tackle. 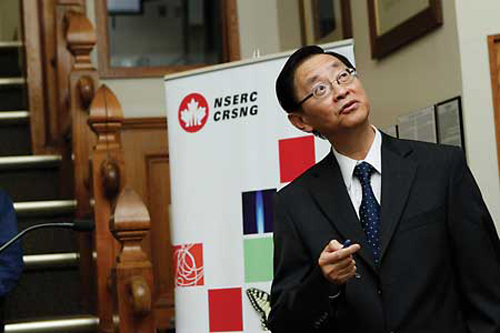 NSERC has announced the renewal of Dr. Yau’s Hydro-Quebec Industrial Research Chair, at a value of over $2 million with contributions from NSERC, Hydro Quebec, McGill and Environment Canada. Under Phase II of the research program, Dr. Yau will continue his work in short-term forecasting of precipitation, with the goal of extending quantitative forecasting by up to seven days in advance, focusing in particular on the precipitation forecast over the province of Quebec. While an accurate weather forecast is helpful when planning a beach day, accurate precipitation forecasts are crucial when predicting where flooding may occur or when estimating the inflow of water into reservoirs, which is essential to the efficient generation and distribution of hydroelectric power. In Phase 1 of the NSERC/Hydro-Quebec Chair program, Dr. Yau developed cutting-edge computer models to improve short-term precipitation forecasting techniques: specifically forecasting when, where, how much, and what type of precipitation would occur over a lead time of one to two days. Numerical weather prediction models are a mathematical representation of the atmosphere. However, it is challenging to develop models that can “look” far enough ahead in time to accurately predict precipitation patterns. To do this, models must perform a huge number of calculations and also be able to incorporate the many physics and dynamics of the weather system. Dr. Yau’s goals are to improve precipitation prediction using the tools developed in Phase I, specifically, state-of-the-art representations of cloud processes that incorporate high-resolution radar observations of weather patterns. Yau will also continue his study of the physics behind the interaction of aerosols —minute particles suspended in the atmosphere— which are known to significantly affect cloud dynamics and the patterns and intensity of precipitation. He is also aiming to improve the representation of convection, the concentrated, collective movement of groups or aggregates of molecules within fluids, in the Canadian computer weather prediction model. Increasing the precipitation forecasting lead time to one week will therefore require a “multi-moment” model, which predicts the mass of precipitation particles, in addition to particle number concentration and radar reflectivity, and the use of a global weather prediction model in tandem with a regional model. Yau’s work will ultimately assist atmospheric and climate scientists in improving both the Canadian regional and the global forecast models, and will assist Hydro-Quebec in better forecast of water inflow into reservoirs. “The improvement of physical processes in the global model would impact positively regional precipitation forecasts, as first guess field for data assimilation originates from the global model,” says Dr. Yau. The funding of Dr. Yau’s Chair affords McGill the resources to fund a Junior Chair, Prof. Daniel Kirshbaum, who is conducting related research. The program will also maintain a stimulating environment for collaborative research between McGill trainees, Hydro-Quebec scientists, and Environment Canada researchers.